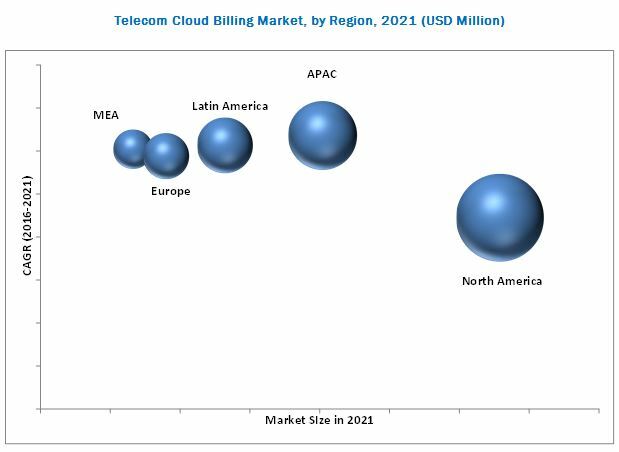 [160 Pages Report] The telecom cloud billing market size is expected to grow from USD 2.49 Billion in 2016 to USD 8.22 Billion by 2021, at a Compound Annual Growth Rate (CAGR) of 27.0% from 2016 to 2021. The telecom billing solutions include a wide array of activities ranging from the process of usage tracking for voice and data, aggregating, levying charges upon respective tariffs, generating invoices to the customers, enabling the customer relationship management through the various cloud based solutions on public, private, or hybrid cloud by the vendor (Operations Support Systems/Business Support System (OSS/BSS) provider) for various Mobile Network Operators (MNOs) all enabled by multi-tenancy. The objectives of the report are to define, describe, and forecast the telecom cloud billing market on the basis of billing, application, cloud platform, deployment, services, end user, rate of charging mode, and region; to provide detailed information regarding the key factors influencing market growth (drivers, restraints, opportunities, and challenges); to track and analyze the market scenario on the basis of technological developments, product launches, and mergers & acquisitions; and to forecast the market size of market segments with respect to five main regions, namely, North America, Europe, Asia-Pacific (APAC), Middle East and Africa (MEA), and Latin America. The base year considered for the study is 2015 and the forecast period has been determined from 2016 to 2021. Analysis of the telecom cloud billing market begins with capturing data on key vendor revenues through secondary research sources such as ITU, TM Forum, World Bank, global billing associations, next generation mobile networks, and GSM Association. Market coverage includes telecom cloud billing vendors such as Amdocs, Ericsson, Netcracker Technology, Oracle, and CGI Group, Inc., a few of them changing their offerings to meet new customer expectations. Insights through in-depth interviews with the top management and thought leaders of the organization are taken into account. Overall market size values are finalized by triangulation with the supply side data which include the product developments, supply chain, and value chain of telecom cloud billing across the globe. After arriving at the overall market size the total market has been split into several segments and sub segments. The figure below shows the break-down of the primaries on the basis of company, designation, and region, conducted during the research study. The major vendors in the telecom cloud billing market are Amdocs (U.S.), Oracle Corporation (U.S.), CGI Group, Inc. (Canada), Ericsson (Sweden), Netcracker Technology (U.K.), Cerillion (U.K), AsiaInfo (China), Computer Science Corporation (U.S.), Redknee Solutions, Inc. (U.S.), Huawei Technologies (China), and Tech Mahindra (India). Further, the report also includes key innovators such as Zuora (U.S.), Mind CTI (Israel), Inc., and jBilling (Canada), who provide telecom cloud billing services and solutions to telecom operators to cater to their requirements and communications needs. The telecom cloud billing market report is broadly segmented into billing, application, cloud platform, deployment, services, end user, rate of charging mode, and region. MarketsandMarkets forecasts the telecom cloud billing market size to grow from USD 2.49 Billion in 2016 to USD 8.22 Billion by 2021, at a Compound Annual Growth Rate (CAGR) of 27.0% from 2016 to 2021. Lower operational & administration costs, advancement & increase in adoption of cloud-based technologies, increasing mobile penetration and high subscriber growth, need for real-time billing, and increased demand for bundled services are some of the driving forces in the market. The scope of this report covers the telecom cloud billing market by billing, application, cloud platform, deployment, services, end user, rate of charging mode, and region. Convergent billing is expected to hold the largest market share because telecom operators are looking at providing combined offerings for their services. Telecom operators offer different services such as voice, data, IPTV, VOIP, prepaid, and post-paid services with different payment models. The customers select one of above services from the operator. All of these offerings need to be served on a single system that can accommodate any line of business, any subscriber type, and any payment model. Among applications, the customer management segment is expected to grow at the highest rate in the telecom cloud billing market during the forecast period. Customer management is the backbone of any business process. It encompasses many functionalities such as customer-interface management, order management, product catalogue, customer service offering, subscriber self-care management, sales & marketing, rate plans and rating, discounting, invoicing, problem handling, auditing and security. Customer management enables Cloud Service Providers (CSPs) to deliver a consistent user experience across the overall business system and to manage all aspects of their relationship with customers. Among cloud platform, the Software as a Service (SaaS) platform is expected to dominate the telecom cloud billing market and hold the largest market share. SaaS model allows CSPs to quickly support new services for their customers and also enables converging of multiple billing systems like prepaid and postpaid onto a single platform. It brings new services to market more economically without installing the entire infrastructure and to support it. One of the major benefits of adopting cloud-based SaaS operations is reduce initial capital costs. Asia-Pacific (APAC) is expected to grow at the highest growth rate in the telecom cloud billing market during the forecast period. The enormous population in the region has led to an extensive pool of subscriber base for telecom companies. There are several factors driving the impressive growth in APAC such as rapid economic development, globalization and foreign direct investment, increasing penetration of smartphones, and rapid internet adoption in individual’s customers. However, telecom regulations and use of legacy systems would be the restraining factors for growth of the telecom cloud billing market. The major vendors in the telecom cloud billing market include Amdocs (U.S.), Oracle Corporation (U.S.), CGI Group, Inc. (Canada), Ericsson (Sweden), Netcracker Technology (U.K.), Cerillion (U.K), AsiaInfo (China), Computer Science Corporation (U.S.), Redknee Solutions, Inc. (U.S.), Huawei Technologies (China), and Tech Mahindra (India). These players adopted various strategies such as new product launches, partnerships, agreements, collaborations, mergers & acquisitions, and business expansions to cater to the needs of their customers. The report also includes key innovators in the market, such as Zuora (U.S.), Mind CTI (Israel), Inc. and jBilling (Canada).